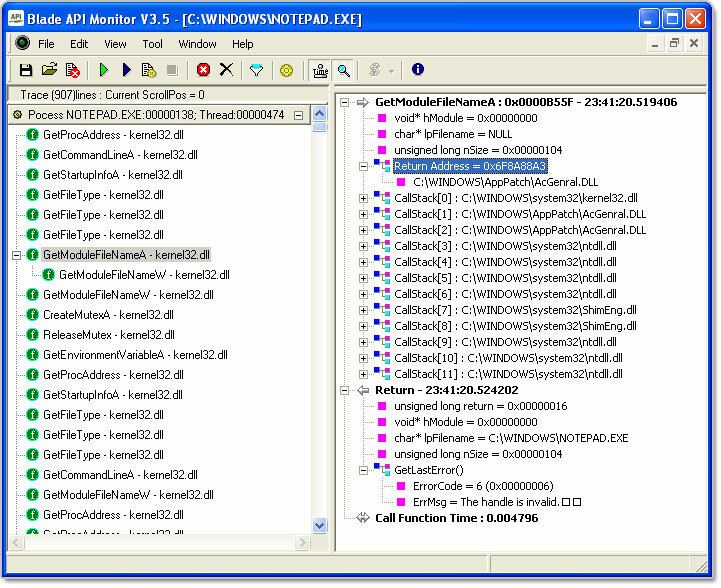 Blade API Monitor, a useful developer spy tool, can trace and log API and ActiveX interfaces with parameters. It can trace any exported functions, internal functions, MFC Class method, functions in source code and ActiveX controls and COM objects Interfaces, and can log all API Call Information. It supports MAP PDB Files, Unicode and ANSI application and multi-thread, etc. It also can predefine 27 API Filter Profiles and 8000 APIs' prototype. Qweas is providing links to Blade API Monitor 3.7.3.2 as a courtesy, and makes no representations regarding Blade API Monitor or any other applications or any information related thereto. Any questions, complaints or claims regarding this application Blade API Monitor 3.7.3.2 must be directed to the appropriate software vendor. You may click the publisher link of Blade API Monitor on the top of this page to get more details about the vendor.